Australian artist, Christina Henri’s ‘Wear A Bonnet – A living Art Installation took place in Grangegorman as a remembrance to the thousands of women who were transported from Ireland to Tasmania through the Richmond Penitentiary, now known as the Clock Tower Building in Grangegorman. 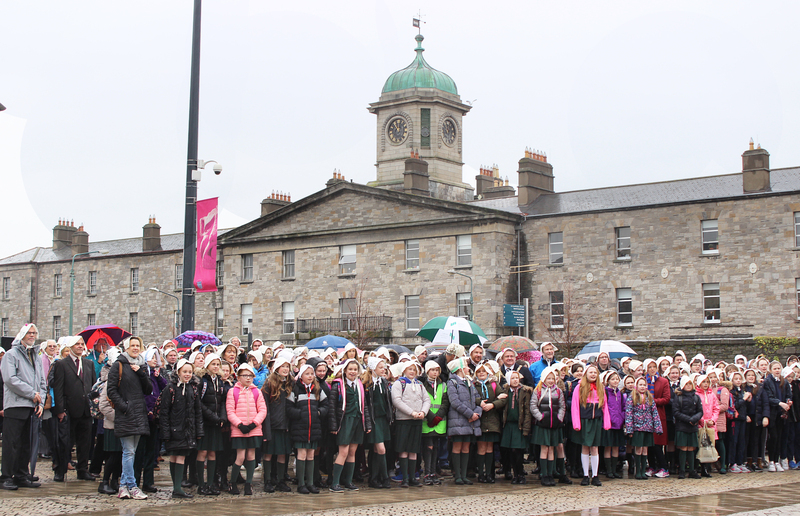 The Grangegorman ‘Wear a Bonnet’ event is a reflection of a similar event held in Hobart, Tasmania in May 2015, where these women and children arrived after transportation. The event took the form of a large crowd photograph. All of the participants were loaned a bonnet for the event which were typical of those worn by female servants at time of transportation. The bonnets have been made over the past number of years by prisoners and staff of the Irish Prison System and each one represents an individual woman who was transported from Ireland in the 1800′s. These bonnets were created as part of Christina Henri’s ‘Roses From the Heart’ project, which has seen the creation of 25,000 bonnets to date around the world. Each bonnet is hand stitched with (where known) the women’s name and age on one side, and the name of the transportation ship with the year the woman left Ireland on. The event took place on 3rd March 2017, with over 400 members of the community, local schools and bus loads from across the country travelling to Grangegorman for this special commemorative art installation. The event was attended by then Lord Mayor of Dublin Brendan Carr and the Australian Ambassador to Ireland Mr. Richard Andrews. It was also attended by two descendants of women who were transported, who spoke briefly on their relatives stories.